Vertical motions measured by GPS ground stations can be used to track water loads related to precipitation. 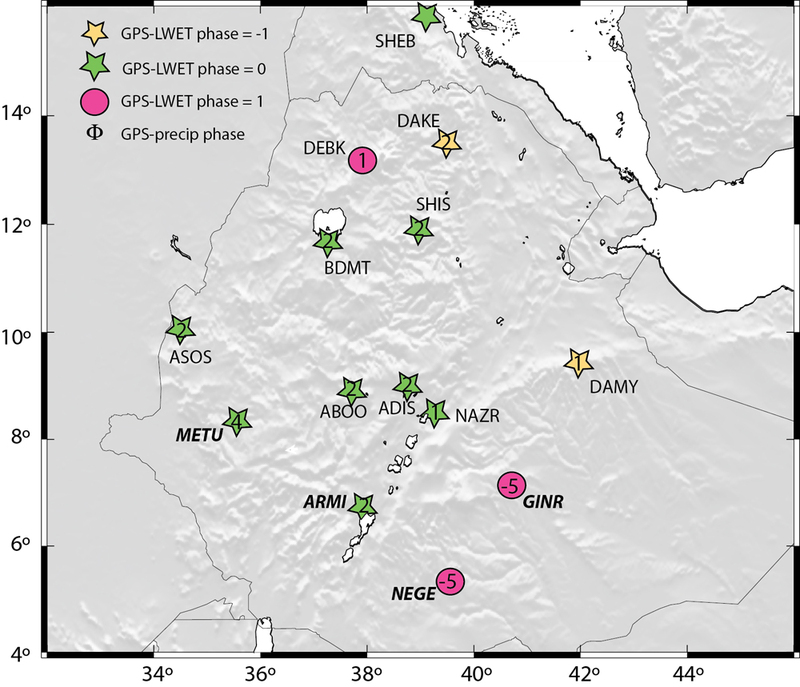 Data from 16 sites covering 8 years (2007 to 2014) of observations in Ethiopia and Eritrea, show the water load developing from the seasonal East African monsoon from June to September and a smaller regional rainy season from February to May. The GPS sites fall as the water is loaded via precipitation and then rise as the load decreases via surface runoff and evapotranspiration. The vertical changes are not affected by crustal thickness, such as a thinner crust over the East African Rift, so that the GPS network is an effective water monitor for the region. The East African rift system in northeastern Africa is a major plate boundary where three plates meet in a triple junction. The three plates (Arabian, Nubian and Somalian) are moving away from each other creating a rift system that starts in Ethiopia and runs south through part of Africa. These plate motions have created major canyons and rift zones in northeastern Africa. A GPS network was established in 2007 to primarily study the plate tectonics of the region. The network of 16 stations in Ethiopia and Eritrea has provided over 8 years of continuous data on the horizontal and vertical motions of this region. Looking more closely at monthly and yearly changes in the vertical motions of the GPS stations, the authors noted changes that may be related to weather and the water cycle rather than tectonics. Past studies in California and the Pacific Northwest have shown that GPS networks can effectively track precipitation changes from drought to heavy rain or snow. Precipitation adds to the load of water on the surface and as the water load accumulates, the GPS station goes down. Stated another way, the ground surface is depressed by the weight of the water load. As the water load decreases, the surface rebounds and the GPS station rises. In northeastern Africa, the patterns of precipitation vary across the GPS network. The northernmost region is very dry, the central region experiences an annual monsoon from June to September and the southern region experiences the mid-year monsoon plus a rainy season in February to May. The GPS vertical motions for the 16 sites were binned into monthly, semi-annual and annual averages. These averages were compared to monthly, semi-annual and annual precipitation averages over the region. The GPS vertical motions correlate with the precipitation patterns. The GPS site response to the water load is immediate indicating that the sites, which are mostly on bedrock, are responding as a simple elastic crust depressed by a water load. The thickness of the crust, which varies across the rift zone, does not affect the vertical motions related to water loading, which is also consistent with an elastic response. Given that the crustal response is so straightforward, the network can be an effective water monitor. Not only does the network monitor precipitation levels and the total water load, but it also helps explain water storage and how the water load is released. The GPS sites suggest about 2 months of water storage and this means that the water leaves primarily by runoff or evapotranspiration. 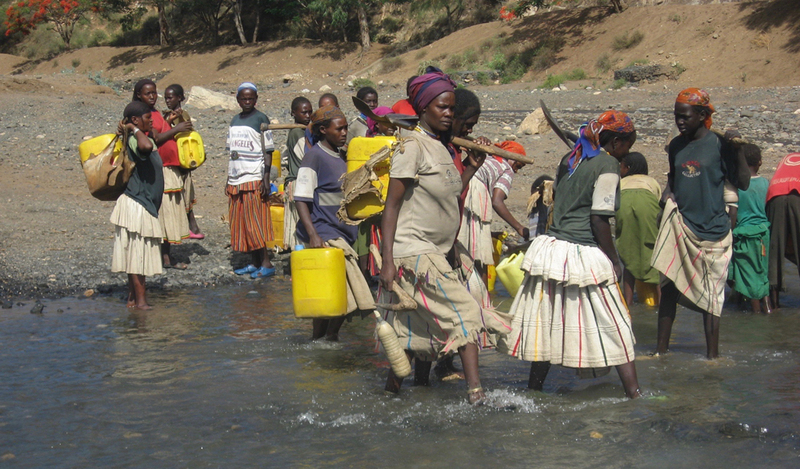 Ethiopia and Eritrea rely on the monsoon and rainy seasons to support 75% of the population that lives by agriculture and herding in rural areas. The GPS network is a cost-effective method to monitor water resources that can help these countries support their communities. 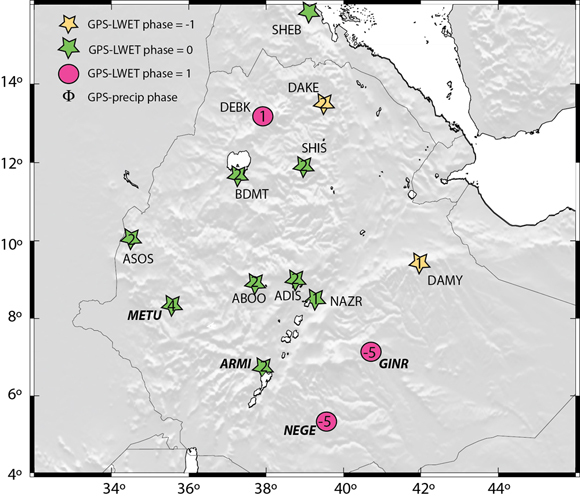 Birhanu, Y., and R. Bendick (2015), Monsoonal loading in Ethiopia and Eritrea from vertical GPS displacement time series, J. Geophys. Res. Solid Earth, 120, doi:110.1002/2015JB012072.